Pesach really is the holiday of freedom. After all of the preparations are over and the seders have been experienced it feels so free. Of course this is true if you go away for all of Pesach. If you are working on chol hamoed it can feel like going back to Mitzrayim. Have a chat sameach for the rest of the chag. Yom tov will soon be upon us. I thought that this image was SOOOO cute. Have a great chag!!! I have been so disgusted with all of the presidential candidates this season that I was not going to vote in the primaries . After much deliberation I decided I was going to actually vote . At 8:40 tonight I voted. The voting center was deserted. Either lots of people voted earlier or not many people voted at all. Maybe the high tech scanner made the voting process so quick there wasn't a chance for there to be a large crowd at the polls. I had forgotten that New York has finally gotten rid of the old circa 1970 voting booths. I am embarrassed to admit that the last time I voted in an election was the last presidential election. That was the inauguration of the the voting scanner. It's so weird to vote in such a high tech fashion. I wonder what the margin of error is . Nothing is foolproof. I'm glad I voted but I am not sure that I chose the best candidate. I am not going to tell you who I voted for so don't bother asking. I am not even sure that if the candidate I voted for wins the nomination that I will vote for them. I haven't decided yet. Then again we still do not know who any of the candidates will be for sure ... yet. What would you do if you won the lottery? I would invest so I would not have to work again. I would spend my days doing the things I like and things I did not have time to do because I work full time. I always think that its a shame that one has to wait to do the things one would do if one was independently wealthy. I can't quit my job yet but I do try to fill my days with things that I enjoy doing . I try not to let work overtake my life. I recently saw the Israeli film WEDDING DOLL by Nitzan Gilady . It is about a spirited mentally challenged 24 year old who lives with her mother and works in a toilet paper factory. The factory will be closing . The friendship she has with the factory owner's son will be ending . This film is more about the journey than the plot. It is about the complexities of this mother-daughter relationship. The acting is superb. The views of the Negev town that they live in is like another character. It is so breathtaking it should be on an aliyah advertisement. This is a very worthwhile film. It won several awards in Israel. One never knows what challenges one will have to face. This film is about how some people chose to face their challenges. Now this is what I call recycling!!! I recently saw the documentary LOOK AT US NOW MOTHER by Gayle Kirschenbaum. Its about a woman who grew up with a very critical mother and how she worked through it and still has a relationship with her mother. The first thing that I thought when I watched this film is thank G-d that my mother is nothing like this mother. The next thing that I thought was how brave it was of Kirshenbaum to have made this film. What you see is a very self confidant daughter who realizes that her mother though flawed did the best that she could and that she was able to forgive her and have a good relationship with her as an adult . Of course this is done with much therapy and work on herself. So many people in this situation are not strong enough to get to the place Kirshenbaum has. Kirshenbaum has used this film as a platform for people who have had emotionally abusive parents to be able to deal with their pasts and move forward . She gives seminars on this subject. 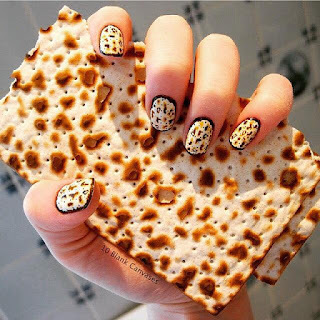 Pesach is coming soon. Its a time for when families converge. Its a time to break free from bad patterns and form stronger bonds with loved ones. Everyone may not have had as tough of a journey as Gayle Kirshenbaum has but we all certainly can learn from it. One of my grandmothers gave me a purple glass punch bowl and matching glasses when I was eighteen as a gift for my future wedding. At the time I was quite surprised because I could not understand why she did not just wait until my actual wedding to give it to me. As it turns out its a good thing that she has already given me a wedding gift because she passed away long ago and I am still single. I do have my first wedding gift . I guess she somehow knew that she would not be around for my actual wedding. It is nice to know that by giving me a wedding gift she believed that I would have a wedding. My other grandmother told me years ago that I didn't need to get married because I am able to take care of myself. I think that she meant it as a way of not pressuring me to get married, but I did not take it that way at the time. Just because a person can take care of herself does not mean she should not get married. Does being able to take care of one's self make them less eligible for marriage? I always thought it would make a person more eligible. Perhaps she was right. I am still single. I suppose I am capable of being alone but I would prefer not to be. A friend of mine told her her grandmother told her before she passed away that she should get married because its better to live life with someone else. A month after her grandmother passed away my friend met her husband and three months later she was married.She felt that her grandmother was looking out for her and that was why she found her husband. I am grateful that I had one grandmother who believed that I would get married enough to have made sure that she has given me a wedding gift in advance. My other grandmother got married at 29 which in those days was like 40. I think that she had wanted me to know that whether I got married or not I would be able to handle it and that it was okay with her. Life does not begin with any specific milestone. Life may change at each milestone, but it does not mean that one is not living life before one gets to that milestone. Life is a gift no matter how much or how little one accomplishes. Living in an old pre-war apartment building in Brooklyn is like having summer all year round. The summers are hot if you don't use an air conditioner and the winters are hot inside with the radiator heat. Open windows are not enough to cool things down. I grit my teeth and use the fan as well. I gave away my space heater years ago. The only positive side of the eternal heat is that in the winter it gets me out of the apartment on the weekends because going outside in 25 degree weather is refreshing compared to the eternal heat indoors. I used to live in a basement apartment that required me to wear layers of warm clothing and a use a space heater in the winter. That was much better than the eternal heat of my current apartment. Eternal heat also means the possibility of lots more mold in the bathroom. and tossing and turning in bed at night because its too warm to sleep. I like living above ground better than below ground and I am not ready to move, but oy, Summer is on the way and I'm ALREADY hot. Parents used to tell their children to eat up all of their food because there were starving people in other countries. Some people like to say to me that I should appreciate the oppressive heat in my apartment in the winter months because some people do not have heat. If I could send all of the extra food and the excess heat to those in need I would. I don't visit people on shabbos who do not use air conditioning in the summer because I find it too oppressive. The people who like it hot better than cold ought to go hang out with the people who prefer standing desks. Then everyone would be happy. A lot of older people tell me not to get old. I never really know what to respond because there really is not a better alternative to getting old. The only way I can take this kind of advice to heart is to always be young at heart. This is the only kind of aging one is in control of . Some people are old at 30 while others are young at 60. It all depends on attitude. Another popular anecdote people like so spout about aging is "It beats the alternative". I used to find this quite annoying until I thought about how true it is. I have experienced the death of my grandparents and father . I have friends who have battled illness. It turns out just being alive and well is an awesome goal and it most certainly beats the alternative. . Perhaps one needs to have lived a little in order to appreciate the glory of life. It is possible to get older without being an old goat. Its just a matter of how you choose to view the world. A lot of older people use their age as an excuse to never have a filter when they speak. Though this is not always a good idea, it must be quite freeing. When one is old one gets to have great stories to tell others about life. An older person can't be young again but then again sometimes that's good too.